...then don't do the crime. Oh my, what did he do? Naughty little boy. Uh-oh...is Wiley a delinquent in training? Oh Wiley...what did you do? Oh oh...Wiley...are you living up to your name?? 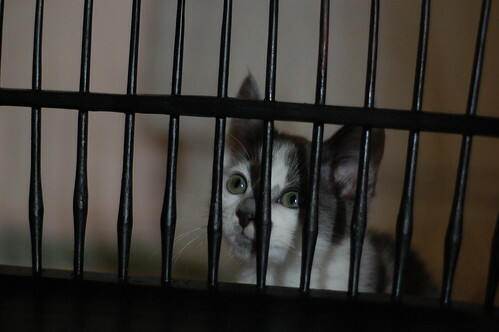 Wiley, did you escape the kitten room again? I know you can't wait to meet Charlene but it won't be long! Did you escape from your room? Get too big a head from looking at your gorgeous self in the mirror and act out? Wiley, Wiley, Wiley . . .
Do you need legal representation? I can file a writ for habeas corpus demanding your release. Only problem is that you misbehaved on a weekend and I don't think we can get a Judge until Monday. My legal advice is just look your adorable self and add a little "what did I do" head tilt every time Ms Laurie even glances your way. Let me know if that doesn't work. With those toes I'd say the boy is capable of escape. Does he have extra toes? Cindy, I'm not a vet so I really don't like to give out any sort of medical advice. I would hate to spread any false information. If the shelter isn't answering your questions regarding the risks, try taking your questions and concerns to your own vet. I can tell you the steps we take to reduce the risks, but I encourage you to speak with a pro. We allow our fosters mingle with Charlene, but keep them quarantined for the first two weeks. When the quarantine is up, and if no one is showing signs of illness (runny eyes, diarrhea, sneezing, lethargic behavior, etc) they are are released. We protect Charlene by keeping her fully immunized. This is how we do it, but your shelter may have different practice and policies. Many people who foster choose to keep their family pets completely separate from the foster animals. So if you're uncomfortable with them mingling, they don't need to mingle. Sometimes the kittens are tested for leukemia when they first arrive at the shelter, sometimes they're tested two weeks after they arrive when they come in for their vaccine boosters. It all depends on their size/age but I'm not sure exactly what that size/age is. Oh no!! We need to give him a little tin cup to rake back and forth against the bars. These pictures are too funny!!! And -- that may be the cutest little paw I have ever seen. That's the face of an angel... not a criminal. You have some very funny fans of your blog! He was framed! He didn't do it and you can't prove it! Agreed, this is false imprisonment for sure! Agreed! This is false imprisonment for sure! He need a tiny little harmonica to play.